On the great Day (Qiyamah) when mankind will be suffering distress and hardship, the sun will be brought near to mankind, until the distance between them is equal to the length of the stick used for applying kohl to the eyes [meel= may also mean a “mile”], and all the people will sweat according to their deeds, except for some of the believers, whom Allah will single out to shade them with His shade, and He will protect them from the sun and from sweating. Let us examine now the characteristics and virtues of these seven categories of people who will be worthy of such an exalted position on the Day of Gathering. Source. The concept of Justice in Islam is very important and it is something which the Muslim - Ruler and the ruled - must apply in all matters without exception. Justice means to give each the right he deserves: Muslim or non-Muslim, relative or stranger, friend or enemy. Unfortunately, even if we admit this in theory, we quickly forget it in practice. So we find that when we speak about our friends and loved ones, we praise them beyond reason and when we speak about those whom we hold difference with, we can find no good in them and we just capitalize on their bad points. This is far removed from the justice which Allah loves and gives great reward for, as mentioned in the following Hadith: 'The doers of justice will be on thrones of light at Allah's Right Hand - and both of Allah's Hands are Right Hands" - those who were just in their ruling, with their families and in all that over which they were given authority. The concept of justice is most important for the Ruler, since he is in charge of his people and the primary disposer of justice in the land. For this reason, the Ruler is given special mention as one of the seven who will be honored with Allah's Shade. Know more about 'The Khalifah (leader/ruler) of Islam' here. 2. A youth who grew up in the worship of Allah. Indeed, it is a great blessing from Allah for a youth he be guided towards worship and be befriended by the righteous, since it is in youth that a person is most vulnerable to the temptations of life and liable to drift away from the Islamic Path. This becomes apparent when we look at society around us and we see that most of the worldly distractions, such as music, games, clubs, fashion etc. are all specifically targeted at the young. 'You're only young once!' they are told, which is why many Muslims nowadays waste their youth thinking that they will pray, wear hijab and go on Hajj, etc. when they are old, as if they have a guarantee of longevity from Allah! Take benefit of five before five: your youth before your old age, your health before your sickness, your wealth before your poverty, your free time before you are preoccupied and your life before your death. ~ Sahih Al-Haakim, musnad Imam Ahmad. 3. A man whose heart is attached to the masjid. Men are encouraged to pray in a masjid and the reward associated with it is tremendous - read here. Not only does it make the person eligible for Allah's Shade on the day of Judgement, but, 'he does not take a step [towards the mosque except that because of it, he is raised by one rank and one sin is removed from him. 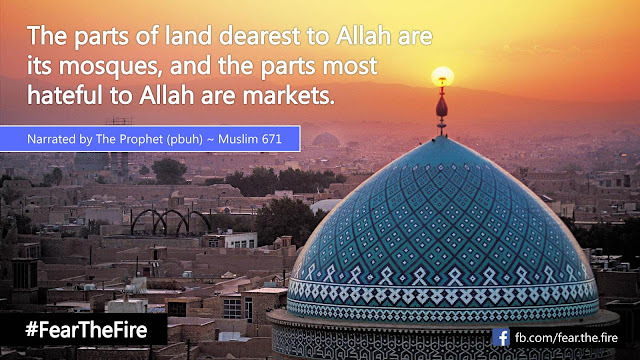 It must be emphasized here however, that all the Hadith encouraging the men to be attached to the mosques are not intended to lead one to the conclusion that Islam is a Religion which should be confined to the mosques, as many people imagine. Nonetheless, the mosque should be at the heart of the Muslim community, and the role of those in authority of the mosques is vital here. They are the ones mainly responsible for making the mosque a welcome refuge for the Muslims, rather than an arena for politics and power struggles as many seem to have become these days. And we seek Allah's refuge from this! 4. Two men who love each other for Allah's sake, meeting for that and parting upon that. Having mutual love for the sake of Allah is one of the great doors leading to the good of the Hereafter and a cause of tasting the sweetness of Imaan in this world. Loving one another for Allah's sake means that the Muslim does not love another except for the correctness of his Deen. So it does not matter what the person looks like, what he wears, how rich or poor he is, where he comes from, or what the colour of his skin is - perhaps you dislike everything about him, but you love him for his Eemaan: this is loving for Allah's sake. Subhan Allah! Imagine being envied by Allah's chosen Messengers and those who were slain in His Path! 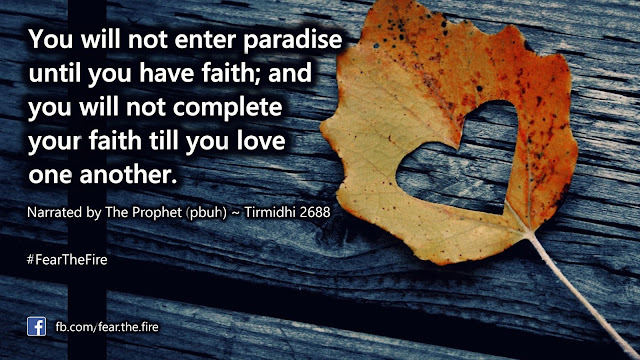 Such is the reward of those who love one another for Allah's sake. 5. A man who is called by a woman of beauty and position but he says: 'I fear Allah'. 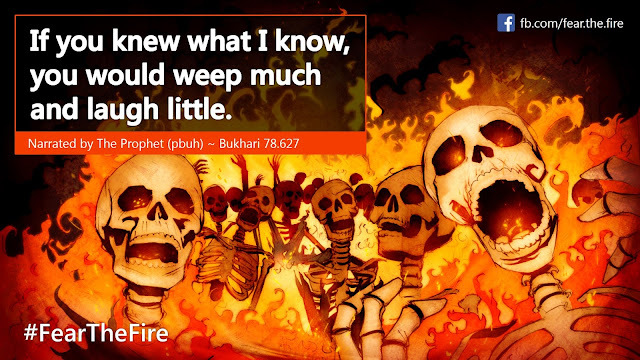 This world is full of temptations which lead to burning in the Fire and amongst them is that which comes from women. Many a man has led his soul into destruction on account of the lure of a woman which is why the Prophet (pbuh) warned his Ummah specifically about this. Zina (adultery or fornication) is a major sin. 6. 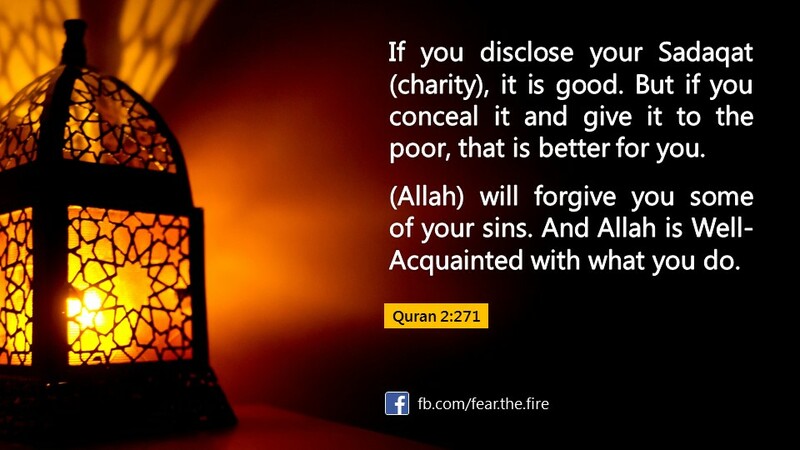 A man who gives in charity and hides it, such that his left hand does not know what his right hand gives in charity. This describes the type of person who goes to great lengths to protect himself from ar-Riyaa. Ar-Riyaa means to do deeds in order to earn the praise and recognition of people. This sin destroys all the benefits that lie in righteous deeds and brings on a serious punishment for the one who commits it. It is particularly dangerous because it is in man's nature to desire and enjoy the praise of others. Thus, great care has to be token to ensure that one's intentions begin and remain pure whenever good actions (such as charity) are being done. Not like what we see today where we have mosque notice boards announcing who gave what to whom, why and when! May Allah safe guard us from this. 7. A man who remembers Allah in private and his eyes get flooded with tears. Crying is not a sissy thing to do. The Prophet (pbuh) who was the best of all creation, would weep as would all of his Companions. Tears are a genuine expression of fear of Allah's Punishment and of our sincere love and awe of Him. But how often do we remember Allah in seclusion and are then moved to tears? How much do we laugh and how little do we weep? 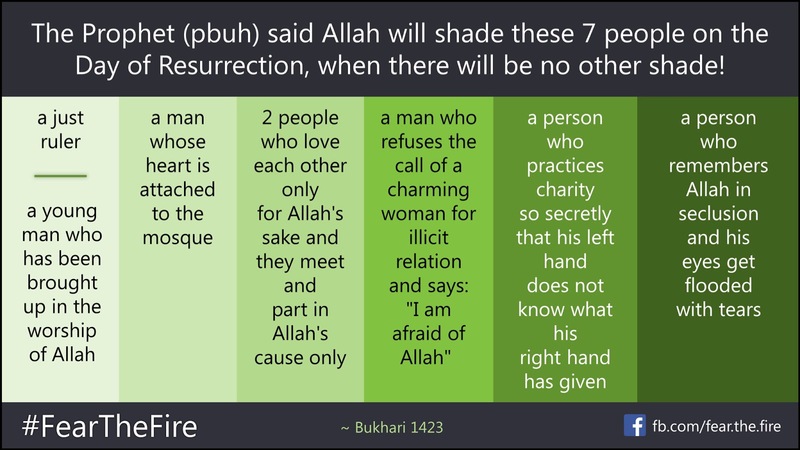 Alhamdulillaah, through these seven types of people mentioned in the Hadith, we have been given clear signposts of the way to attain Allah's pleasure and satisfaction. 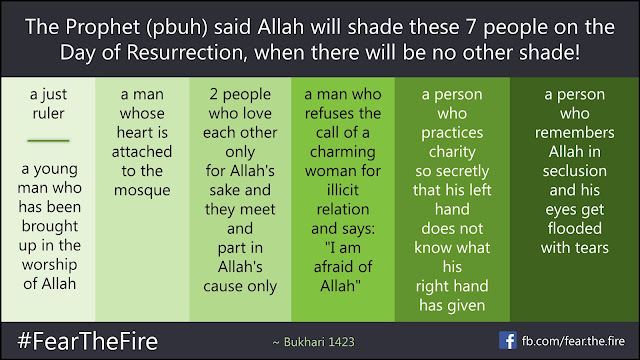 So dear brothers and sisters in Imaan, devote yourself to being one amongst those seven, for indeed fortunate will be those who are granted Allah's Shade on the Day when there will be no shade but His.